Orangutan Foundation in 2018 - A year of achievements & challenges. Thank you to everyone who had their donation matched during the Big Give Christmas Challenge. Our £20,000 target, was reached in just two days, and has raised vital funds to protect forests, home to over 4,600 critically endangered orangutans. Thank you for generously responding to our Habitat Protection Appeal launched in March, which raised over £50,000. Thank you for your continued support, we cannot do this without you. As the year comes to an end, we want to take this opportunity to let you know how your support is making a difference. Our Indonesian vet and field assistants monitor the reintroduced orangutans in the Lamandau Wildlife Reserve and provide care for the young orangutans in our soft-release programme. 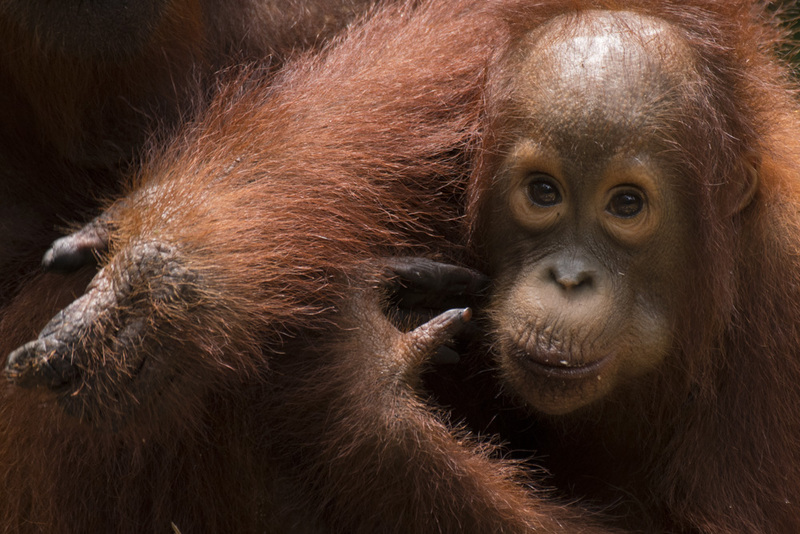 We are actively protecting two viable and healthy orangutan populations and the recent wild births of Happy born to Hola and Monti born to Max, in the Lamandau Wildlife Reserve, provides evidence for this. We work to ensure orangutans stay in the wild. When essential our rescue team will rescue and translocate wild orangutans to safety. Sadly, blind orangutan Aan, can never live back in the wild due to injuries sustained from being shot at over 100 times. 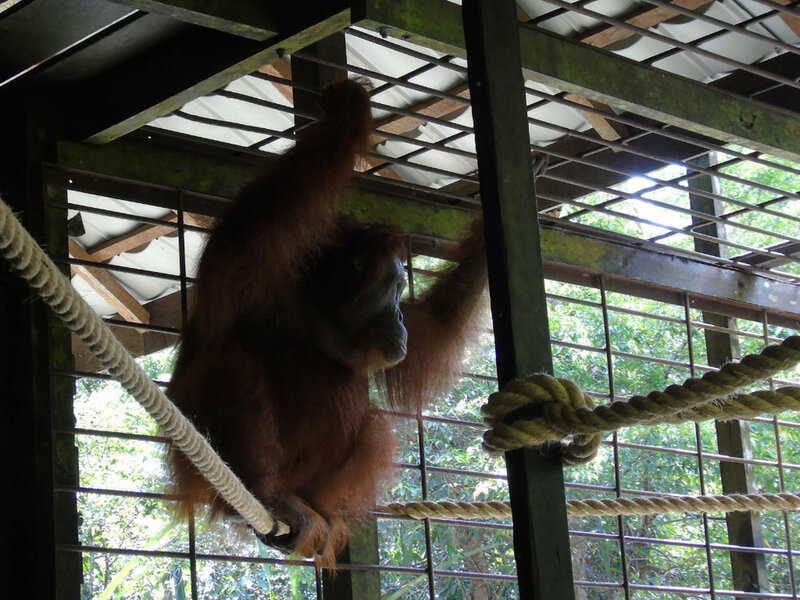 Our staff provide Aan with the best life possible, with ropes and browse in her enclosure. We are making a difference where it really counts. In August, we organised a weekend of festivities to celebrate World Orangutan Day in the city of Pangkalan Bun, Central Kalimantan Indonesian Borneo. In February and March, our staff, with the wildlife department and fire-fighting units, extinguished raging fires threatening the wildlife reserve. This glimpse of a clouded leopard, shows just one of the incredible but threatened species we study at Pondok Ambung Tropical Forest Research Station, Tanjung Puting National Park. In 2018, we have been running a socialisation campaign aimed at local farming communities, to increase awareness about orangutans, to reduce the numbers being injured or killed. This month we handed out calendars with a clear message about how to avoid conflicts with wildlife. To reduce pressure on forests cleared for agriculture, we work closely with rural villages. At the request of a local woman’s group we have helped with training to use fruit from mangroves to make jam. We are also supporting the establishment of agro-forest demonstration plots, which provide an alternative to clearing land to grow oil-palm. For the 18th year running, we welcomed a group of enthusiastic volunteers from around the world. This year they renovated one of the guard posts protecting the Lamandau Wildlife Reserve. We are proud of what we have achieved this year, but we know the challenge that lies ahead - the real and ongoing threat of habitat loss. Please continue to support us in 2019 and beyond. We and you do make a difference.